We don't just supply hardwood logs - we can also remove windblown and fallen trees, and cut trees on customers own land including hire of the log splitter. 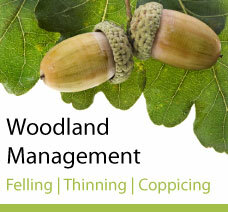 Working with private woodland owners, woodland investment companies, local & district councils and wildlfe & conservation groups we can provide woodland management services including coppicing, felling and thinning. This is an ancient form of sustainable woodland management which makes use of the ability that some trees have to regenerate themselves when they are cut. In this system the tree is cut to ground level in the winter months and then left to regrow. When it reaches a harvestable size it is recut. This is a 'cycle' or 'rotation'. The idea is that woodland areas, known as 'cants' or 'coups' are cut sequentially. The number of these areas being the time in years for the trees to reach a harvestable size so there is always annual produce. When woodlands are planted the young trees are closely planted so they compete with each other and 'draw' each other up towards the light. This encourages straight growth. As the trees grow older thinning takes place periodically. The purpose is to selectively remove poor specimen trees and/or to give more space and light to those with a greater potential to grow into fine mature trees. 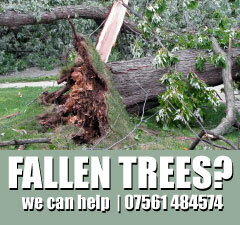 We can come and visit your woodland or forest and harvest or thin your trees. We offer a low impact service and are happy to visit your site to discuss options. We fell manually using chainsaws and extract using a 4 wheel drive tractor and timber trailer with crane and grab. We are happy to visit your site and discuss all options available. Your harvested trees could be sold 'roadside' to the open market or be processed into logs or wood chip for your own use. We have a wood fuel grade chipper and firewood processor available for hire with operators to complete the process. We also have an 8 wheel drive forwarder with low ground pressure for hire.